Fattahi, P., Tanhatalab, M., Bashiri, M. (2017). Enhanced chromosome repairing mechanism based genetic algorithm approach for the multi-period perishable production inventory-routing problem. 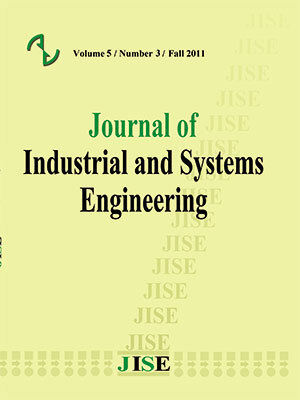 Journal of Industrial and Systems Engineering, 10(special issue on production and inventory), 30-56. Parviz Fattahi; Mehdi Tanhatalab; Mahdi Bashiri. "Enhanced chromosome repairing mechanism based genetic algorithm approach for the multi-period perishable production inventory-routing problem". Journal of Industrial and Systems Engineering, 10, special issue on production and inventory, 2017, 30-56. Fattahi, P., Tanhatalab, M., Bashiri, M. (2017). 'Enhanced chromosome repairing mechanism based genetic algorithm approach for the multi-period perishable production inventory-routing problem', Journal of Industrial and Systems Engineering, 10(special issue on production and inventory), pp. 30-56. Fattahi, P., Tanhatalab, M., Bashiri, M. Enhanced chromosome repairing mechanism based genetic algorithm approach for the multi-period perishable production inventory-routing problem. Journal of Industrial and Systems Engineering, 2017; 10(special issue on production and inventory): 30-56. One of the important aspects of distribution optimization problems is simultaneously, controlling the inventory while devising the best vehicle routing, which is a famous problem, called inventory-routing problem (IRP). When the lot-sizing decisions are jointed with IRP, the problem will get more complicated called production inventory-routing problem (PIRP). To become closer to the real life problems that includes products that have a limited life time like foods, it seems reasonable to narrow down the PIRP problem to the perishable products, which is perishable-production inventory-routing problem (P-PIRP). This paper addresses a P-PIRP in a two echelon supply chain system where the vendor must decide when and how much to produce and deliver products to the customer’s warehouse. Here, the general model of PIRP as mixed integer programming (MIP)is adopted and the perishability constraint are added in order to solve the P-PIRP problems. Due to the complexity of problem, providing solution for the medium to large instances cannot be easily achieved by business applications, and then using the meta-heuristics is unavoidable. The novelty of this research is devising an enhanced genetic algorithm (GA) using multiple repairing mechanisms, which because of its computationally cumbersomeness have absorbed less attention in the literature. The problem runs through some generated instances and shows superiority in comparison to the business application. Abdelmaguid, T. F. & M. M. Dessouky (2006) A genetic algorithm approach to the integrated inventory-distribution problem. International Journal of Production Research, 44, 4445-4464. Adulyasak, Y., J.-F. Cordeau & R. Jans (2015) The production routing problem: A review of formulations and solution algorithms. Computers & Operations Research, 55, 141-152. Al Shamsi, A., A. Al Raisi & M. Aftab. (2014) Pollution-inventory routing problem with perishable goods. In Logistics Operations, Supply Chain Management and Sustainability, 585-596. Springer. Andersson, H., A. Hoff, M. Christiansen, G. Hasle & A. Løkketangen (2010) Industrial aspects and literature survey: Combined inventory management and routing. Computers & Operations Research, 37, 1515-1536. Bell, W. J., L. M. Dalberto, M. L. Fisher, A. J. Greenfield, R. Jaikumar, P. Kedia, R. G. Mack & P. J. Prutzman (1983) Improving the Distribution of Industrial Gases with an On-Line Computerized Routing and Scheduling Optimizer. Interfaces, 13, 4-23. Campbell, A. M. & M. W. P. Savelsbergh (2004) A Decomposition Approach for the Inventory-Routing Problem. Transportation Science, 38, 488-502. Clarke, G. & J. W. Wright (1964) Scheduling of vehicles from a central depot to a number of delivery points. Operations research, 12, 568-581. Coelho, L. C., J.-F. Cordeau & G. Laporte (2014) Thirty Years of Inventory Routing. Transportation Science, 48, 1-19. Coelho, L. C. & G. Laporte (2014) Optimal joint replenishment, delivery and inventory management policies for perishable products. Computers & Operations Research, 47, 42-52. Devapriya, P., W. Ferrell & N. Geismar (2016) Integrated Production and Distribution Scheduling with a Perishable Product. European Journal of Operational Research. Dror, M. & P. Trudeau (1989) Savings by split delivery routing. Transportation Science, 23, 141-145. Federgruen, A., G. Prastacos & P. H. Zipkin (1986) An allocation and distribution model for perishable products. Operations Research, 34, 75-82. Kleywegt, A. J., V. S. Nori & M. W. P. Savelsbergh (2002) The Stochastic Inventory Routing Problem with Direct Deliveries. Transportation Science, 36, 94-118. Le, T., A. Diabat, J.-P. Richard & Y. Yih (2013) A column generation-based heuristic algorithm for an inventory routing problem with perishable goods. Optimization Letters, 7, 1481-1502. Mester, D., O. Bräysy & W. Dullaert (2007) A multi-parametric evolution strategies algorithm for vehicle routing problems. Expert Systems with Applications, 32, 508-517. Mirzaei, S. & A. Seifi (2015) Considering lost sale in inventory routing problems for perishable goods. Computers & Industrial Engineering, 87, 213-227. Moin, N. H., S. Salhi & N. Aziz (2011) An efficient hybrid genetic algorithm for the multi-product multi-period inventory routing problem. International Journal of Production Economics, 133, 334-343. Rahimi, M., A. Baboli & Y. Rekik (2016) Sustainable Inventory Routing Problem for Perishable Products by Considering Reverse Logistic. IFAC-PapersOnLine, 49, 949-954. Savaşaneril, S. & N. Erkip (2010) An analysis of manufacturer benefits under vendor-managed systems. IIE Transactions, 42, 455-477. Shaabani, H. & I. N. Kamalabadi (2016) An efficient population-based simulated annealing algorithm for the multi-product multi-retailer perishable inventory routing problem. Computers & Industrial Engineering, 99, 189-201. Sindhuchao, S., H. E. Romeijn, E. Akçali & R. Boondiskulchok (2005) An integrated inventory-routing system for multi-item joint replenishment with limited vehicle capacity. Journal of Global Optimization, 32, 93-118. Soysal, M., J. M. Bloemhof-Ruwaard, R. Haijema & J. G. van der Vorst (2015) Modeling an Inventory Routing Problem for perishable products with environmental considerations and demand uncertainty. International Journal of Production Economics, 164, 118-133.